Kayak Instructor Cate Hawthorne shares tips, trips, stories gear, and inspiration from adventures on the water and in nature. The day started with good intentions of getting work done - work on our website, bookkeeping, preseason marketing, and assorted other tasks. BUT, it was just too beautiful to be indoors so off I headed on my mountain bike. Spring is definitely springing on the Mendocino Coast. The redwood forest was dappled with sunshine and flowering trilliums and milkmaids. Riding along, I didn't want my ride to end. The air was fresh, clean, comfortable, and the Pacific wrens were chortling away their bubbly, cheerful song. My belly told me it was time to go home for lunch so I did. The to-do list remained but the weather was so beautiful. Getting out on my stand up paddle board was on the to-do list right? So I loaded up my Jackson SuperFishal and headed down to the Noyo River. As I unloaded my board and prepared to launch, I was enamored with the typical sights and sounds of the Noyo River. A pair of deer wandered down to the rivers edge, a pair of Bufflehead ducks bobbled and dove in the river, and George the mute swan gracefully glided along with the current. Belted Kingfishers rattled their tune and morning doves cooed. While much was common, I did discover a few new things. Paddling up the river, I noticed new siding on the A n W logging road bridge. I was also super excited to see a green heron. This one was a little less shy than usual and let me get a photo. Hopefully, its mate is nearby and they will be nesting on the river again. 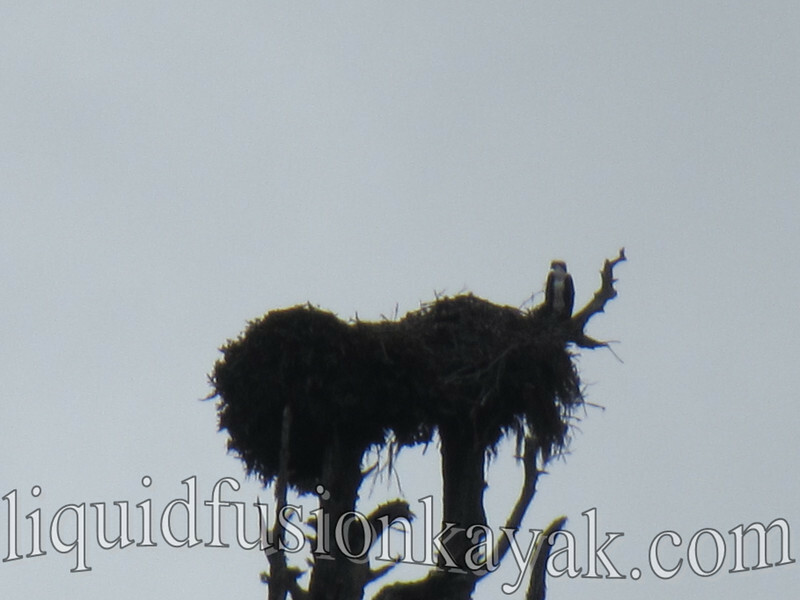 New as well is the return of the osprey. I saw one quietly flying over the river. They are still a bit quiet but soon will be back - soaring in the skies, patrolling the waters, and tending to their gigantic nests. Liquid Fusion Kayaking is in the NEWS - we get a nice mention in KCET.org's article Paddling Along the Rivers of Mendocino County. Jeff and I have been enjoying winter and some personal paddling time but this gets us really excited for Liquid Fusion Kayaking's spring and summer season which we kick off in May. The alarm went off. Our bed was warm and snuggly, and I was comfortable and content. My bladder said otherwise . . . I thought of returning to bed, but Jeff was up too so it was game on. Surf kayaks were loaded, wetsuits donned, and off we went. It was foggy and gray. A small short period swell made us wonder if staying in bed would have been better. We were in for a surprise. Within moments of arriving at the beach, the fog lifted revealing calm seas, glassy overhead waves and several gray whales frolicking just beyond the surf. As dawn retreated and the sun started to rise, clouds over the ocean layered the sky in peaceful pastels of gray and blue. The ocean was a sheet of shimmering glass with gently rolling swells that became glassy green walls with feathering frosted lips as they rolled into the beach. I paddled out. When I got to the outside, I revelled in the quiet beauty of the sea. Gentle swells of contentment rolled under my boat and permeated my soul. Moments later one of the twinkling bumps of glass steepened up behind me. As the wave lined up, I paddled and glided onto its face as it started to curl. I danced with the cascade of whitewater as it chased me down the line - subtly moving back to the pocket then turning and accelerating up to the lip of the wave and gliding back down again. Time seemed suspended as the wave, my boat, and I danced our way across the bay. Just before the frothy white curtain fell, I bowed out and paddled back out into the glistening sea. Wave after wave, the dance continued as the sun rose. Some with more drama than others including the missed step of losing and having to replace a contact lens. But most with long graceful rides - those moments of peaceful happiness that become a permanent part of ones soul. The sun was up and our session had to end. It was time to send Jeff off to Santa Cruz for the 29th Annual Kayak Surf Festival - now known as Santa Cruz Paddlefest. Neither of us had a camera but agreed that impressions of this morning will last forever. ***A note on Santa Cruz - I decided not to compete this year as I did not want the stress of competition or feeling like I have to perform for an audience - call it stage fright, performance anxiety, the realization that I am not that good, or something else - doesn't really matter. I am working on my skills in my hp surf kayak and may someday participate in the contest when I think it will be fun for me. Ultimately, it is mornings like this that I seek when I am surfing.